Birthplace : Dayton, Ohio, U.S.
Edwin Moses (also known as: Edwin Corley Moses) born August 31, 1955 in Dayton, Ohio, United States is an African-American track and field athlete. 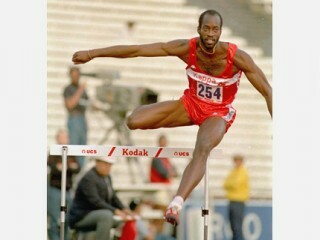 Hurdler Edwin Moses is a four-time world-record holder in the 400-meter hurdles. He first set a new record with a time of 47.63 in 1976, and reduced it to 47.45 in 1977 and 47.13 in 1980. In 1983, he cut his time to 47.02. He was a two-time world champion, in 1977 and 1987, and won gold medals in the Olympics in 1976 and 1984. Moses grew up in Dayton, Ohio, the middle son of Gladys and Irving Moses. Irving Moses had been a football center during his college career at Kentucky State, and later taught math and science and was principal of an elementary school. Gladys Moses was a supervisor of instruction for the Dayton public school system. Naturally, Moses' parents emphasized academic achievement, particularly in science, and sports came in a distant second. Moses, who like his father had a scientific mind, often read the encyclopedia for fun as a child. When he was older, he and his brothers Irving Jr. and Vincent dissected frogs, launched homemade rockets, and made models of volcanoes and cars. Moses also played the saxophone and enjoyed creating art. When his local school auditorium was set on fire, probably by students, Moses chose to be bused to another school four miles away, where he was one of only 20 African Americans in a student body of 800. In summer school, he took science and math courses for extra credit, and often tutored other students. Although he was on the track team, he was small-5'8" and 135 pounds--and was not considered a potential athlete. "Track was almost incidental," he told Curry Kirkpatrick in Sports Illustrated. Moses attended Morehouse College in Atlanta, Georgia, a traditionally African-American institution, on an academic scholarship. He studied physics and engineering, and he was also on the track team. Unfortunately, the school had no track, and the athletes had to train wherever they could. At college, he was called the "Bionic Man" because of the intensity of his training, as well as the intensity of his studying; he would later apply his scientific, mathematical and analytical talents to his athletic career. While at college he grew, eventually reaching 6'2". His legs were fully half of his height, a trait runners call "split high," and this trait would later help make him a world-record hurdler. In 1975, Moses began talking about going to the Olympics. He did not yet have a plan; his talk was more intuition than anything else. And in March of 1976, at the Florida Relays, Moses ran times of 13.7 in the high hurdles, 46.1 in the 400 meters, and 50.1 in the intermediate hurdles. Although he didn't win any of these races, his ability was obvious to Olympic coach Leroy Walker, who attended the race. Walker told Kirkpatrick, "His size and speed; his base, the ability to carry the stride; his 'skim,' what we call the measurement of the stride over the hurdle--he had it all." One secret of Moses' success was his stride, and his ability to run with the same stride length even when he tired at the end of a race. Hurdlers try to make their steps between hurdles smooth and even, so that as the runner approaches the hurdle, he soars over it without breaking stride or "chopping" his steps. Moses' long legs and 9-foot, 8-inch stride, as well as his endurance, gave him the unique ability to run thirteen strides between hurdles throughout a 400-meter race, even at the end, while all other hurdlers ran thirteens at the beginning of a race, shortening their steps and increasing to fourteen or fifteen strides between hurdles as they became tired. In addition, Moses' long legs allowed him to simply float over the hurdles; as his wife, Myrella Moses, later told Kirkpatrick, "Edwin's advantage is that the other fellas actually have to jump over the hurdles." At the NCAA Division III championships, held in Chicago in 1976, Moses fell when his sunglasses fogged up. Later in the year, he ran at the AAU meet at UCLA against top hurdlers. He was in the lead, flying along, and tried to look back to see where the other runners were. That one moment of distraction made him hit the seventh and ninth hurdles and stumble over the tenth--but he finished in fourth place, with a time of 48.99. From then on, he never again looked back during a race. "Edwin Was Like the Lone Ranger"
At the trials for the 1976 Olympics, Moses set an American record in the 400 hurdles. And at the Olympics, held in Montreal, he set a world record with a time of 47.63, and won a gold medal. At the time, Moses was not well known and was viewed as an enigma by the press and the public. His eyes had been sensitive to sunlight since the fifth grade, and he had to wear prescription sunglasses during competition so that he could see the hurdles. However, observers claimed that he wore the sunglasses as a political or social statement. In Sports Illustrated, Hurdler Andre Phillips told writer Curry Kirkpatrick that he recalled seeing Moses "with the [sweat suit] hood up and the glasses. The dude had come out of nowhere and there he was and you still couldn't see him. No face. Edwin was like the Lone Ranger. . . . He was--like, wow!--hands off, alone, cool. I really got into the hurdles after that." After his Olympic win, Moses did not receive the recognition he thought he would. He told Kirkpatrick, "I guess I expected to be recognized or doors would open or lights would flash or something. But it was like . . . nothing. The race, the gold, the Olympics. [It was like] None of it . . . had . . . ever . . . happened." He returned to Morehouse to complete his education, and for the next few years he was criticized for not running indoor events, for not running other outdoor events, for not having a coach, and for not joining a track club. After graduating with a 3.5 average and a degree in physics and engineering, Moses moved to California, where he worked as an aerospace engineer for General Dynamics from 1978 to 1979. He also continued to run, although he was bored with the lack of true competition against him, and even more frustrated when the United States boycotted the 1980 Moscow Olympics for political reasons and he, like all other American athletes, lost his chance to compete there. In 1977, Moses lowered his world record to 47.45. He also won the world championship title. Moses met his wife, Myrella Bordt, in West Berlin in the summer of 1980. She was a movie set and costume designer, and a track fan--in fact, she was such a fan of Moses that she had his photo on her bedroom wall. She told Kirkpatrick, "I knew this was the guy. He was gorgeous going over the hurdle--the look, the form, the mood it portrayed. He was compelling." In that same year, Moses set a new world record in the 400-meter hurdles: 47.13. In 1982, he and Bordt were married. Moses applied his scientific mind to his training, using a heart rate monitor and athletic watch to guide his workouts. He tracked his training sessions on his home computer, analyzing the numbers and using them to plan future efforts. In Sports Illustrated, Kenny Moore wrote, "His workouts take two or three hours. He was educated to be an engineer. He is also an engine. He knows all his working parts. If something takes time, he gives it time." At the end of August in 1983, Moses dreamed he saw the numbers "8-31-83" then, repeatedly, the numbers "47.03." "8-31-83" was his 28th birthday, and "47.03" was a very good time in the 400-meter hurdles--so good, in fact that it was a tenth of a second better than the world record Moses had set in 1980. "8-31-83" was also the date of a race Moses was due to run in Koblenz, West Germany. At the race, he was relaxed--so relaxed that he went to the starting line without socks and still wearing his watch, which he customarily took off before racing. In the weeks before the race, he had run 47.37 and 47.43 in the 400-meter hurdles. His relative slowness in these runs was due to the fact that he had gone out so fast and with such intensity that he ran up on the first hurdles in twelve strides, had to chop his steps to get over the hurdles, and lost momentum and speed. At the race in which he ran 47.43, he told Kenny Moore in Sports Illustrated,, "Everything was bad. I lost at least three-tenths [of a second], chopping, and I got tired awfully early." So, at Koblenz, Moses decided to relax. Europeans are great fans of track and field, and the stadium was filled with 22,000 spectators. At the starting gun, Moses took off and cleared the first hurdle perfectly. He chopped at the second, third, and fifth hurdles, running even with American Andre Phillips. At the seventh hurdle, Moses accelerated. Phillips told Moore, "I saw him take a little look over his shoulder. And he just took off!" For the last 90 meters, Moses flew, not chopping, running seamlessly. His time was 47.02, a world record by .11 of a second--and a hundredth of a second faster than the time in his dream. As a result of his world record, Moses received the 1983 Sullivan Award for Best Amateur Athlete. At the time, only three other runners had ever run the 400-meter hurdles faster then 48 seconds: Moses, Harald Schmid, John Akii-Bua, and Andre Phillips. Schmid accomplished the feat three times, and Akii-Bua each did it once. By July of 1984, Moses had done it twenty-seven times. When Moses set that new record, he became instantly famous. Interviews in the media, advertising contracts, and other promotions changed the way the public viewed him. Moses told Kirkpatrick that before his record, interviewers focused on numbers and statistics: How many hurdles were there in the race? How fast could he run them? Moses commented that reporters didn't ask him personal questions, and assumed that because he often wore dark glasses and was an analytical person, reporters assumed, he said, "that I was aloof and distant and unapproachable and--I loved this one--radical. I felt like going around saying, 'I didn't do it.'" In contrast to this image, he said, "I've always made friends easily." Moses gradually improved his public image, and by 1984, was noted for speaking out against the use of performance-enhancing drugs in sports. As a member of the 1984 U.S. Olympic team, he was chosen to represent the other athletes and recite the Olympian oath, in which athletes pledge to compete fairly and with honor. He kept his winning streak going during these Olympics, winning his second gold medal in the 400-meter hurdles. In June of 1987, his streak of 107 consecutive wins in over nine years was finally broken. Twenty-one-year-old Danny Harris beat the 31-year-old Moses at a race in Madrid, Spain. Moses, who had felt increasing pressure as his winning streak grew longer, was actually relieved that he could now simply concentrate on running fast rather than on winning. Nevertheless, he went back to winning, taking his second world title in Rome in 1987. In that race, he beat Harris by two hundredths of a second. At the 1988 Olympics, held in Seoul, Korea, Moses came in third in the 400-meter hurdles, winning the bronze medal with a time of 47.56. After the final race, he and the other winners gathered at the interview area, waiting for the press, and out of long habit, Moses sat in the middle seat, traditionally the place of the gold medal winner. That winner, American Andre Phillips, was horrified when a Korean official told Moses to move over and give Phillips the center seat. Phillips told Pat Putnam in Sports Illustrated, "I mean a chair is a chair. I was just going to come in and plop down." He said that he did not ask Moses how he felt about being asked to move over, but noted, "It was a strange moment." An ironic twist to this event was that in order to win the bronze, Moses ran faster than he had for either of his previous Olympic gold medals. In 1989, Moses became a member of the U.S. Olympic Committee's substance abuse committee. He also switched sports and began training with the U.S. bobsled team, hoping to compete in the 1992 Winter Olympics. Those hopes fell through, and he also did not qualify to run the hurdles at the 1992 Summer Olympics. After that, he worked with the Special Olympics, Montana State Games, Goodwill Games, and the Olympic Festival. On July 4, 1991, Moses and Myrella Bordt divorced. Sports Illustrated writer Frank Deford wrote that at his peak, Moses, "was not only a hero to the world, but also, within his own subculture, an adviser, a spokesman, a counselor, a mediator, a diplomat. . . . No athlete in any sport is so respected by his peers as Moses is in track and field." Moses' brother Irving told Kirkpatrick, "Edwin is hurdling, body and soul." After retiring from competition, Moses earned a Master in Business Administration in Business Management degree from Pepperdine University in Malibu, California in 1994. He was a founding partner of The Platinum Group, a business management agency for world-class athletes, and then spent several years working as a financial consultant in investment management consulting for the Consulting Group, a division of the investment bank Salomon Smith Barney. Eventually, however, he told Yi-Wyn-Yen in Sports Illustrated, "I just got burned out. I wanted to get back into public speaking and do something worthwhile." Moses joined Laureus, a volunteer group of retired world-class athletes who receive corporate funding to run international sports programs. According to Yen, in only the first two months of 2002, he flew 27,000 miles around the world while working for the group, and visited South Africa, Australia, and China. Although he no longer runs, he remains fit through healthy eating and by riding his mountain bike on as many errands as possible. 1976, At U.S. Olympic Trials, sets new American record in 400-meter hurdles; 1976, Wins Olympic gold medal and sets world record of 47.63 in 400-meter hurdles; 1977, Sets new world record of 47.45 in the 400-meter hurdles; 1977, Wins world championship in 400-meter hurdles; 1980, Sets new world record to 47.13 in 400-meter hurdles; 1983, Sets new world record of 47.02 in 400-meter hurdles; 1983, Receives Sullivan Award for best U.S. amateur athlete; 1984, Named Sports Illustrated Sportsman of the Year; 1984, Wins second Olympic gold medal; 1987, Wins second world title in Rome; 1988, Wins Olympic bronze medal in 400-meter hurdles; 1994, Inducted into National Track and Field Hall of Fame. View the full website biography of Edwin Moses.